*Learn in Montreal BEFORE you trip! The easiest way to become a diver in Montreal! 1. Theory online at your own pace; 2. One weekend in an indoor pool; 3. Certification possible either 15 minutes from Montreal or down South. Fins, booties, mask and snorkel appropriate for scuba diving. We will review this with you during the One-on-one private session. It is very advantageous to buy your equipment with Total Diving as a guarantee of success. In addition, we guarantee that your equipment will be adapted. 3mm wetsuit. 5 hours a day in the pool is a long time when you are not used to it! PADI Scuba Lessons in Montreal – Why? Why Total Diving is the Best teaching team to learn scuba diving? The first step in completing your PADI Open Water Diver certification is theory. Total Diving makes it easy for you to understand and finish the theory portion in a shorter amount of time with PADI eLearning. Learning scuba diving theory online is standard at Total Diving - and it’s a whole lot more convenient for you! The eLearning is comprised of 5 chapters with mini-quizzes to test your knowledge. The advantage of eLearning is that you no longer have to spend long hours in a classroom reading a book with the instructor, and you can even go at your own pace! Take as much time as you need to read and understand the material so that the next steps run as smoothly as possible - and you’ll have more fun that way! If you ever have any questions during your eLearning, there are instructors available to help you fully understand the material. Your safety is our priority, which is why we put aside time to help work through some of the difficult theory questions during the rest of your training. The second step to becoming a certified scuba diver is your confined water (pool) training. Total Diving offers you two options to fit your busy schedule: A series of Wednesday evenings or one intensive weekend. The Wednesday evening options runs for four weeks, or four sessions, while the intensive weekend is two big days of learning how to dive, by diving. Regardless of which option you choose, you will learn how to do and apply the skills you learned in the eLearning. Instructors and Divemasters will guide you through scuba techniques in the pool to assure that you will become a safe and informed diver. Total Diving uses the indoor heated Aquadome in LaSalle for all of our pool training. This step of the training can be done in a group no bigger than 12 students, or you can opt for our private session option. The private course option is a great way to become comfortable in the water, and is also the preferred option for kids and teenagers who need a bit more attention. The last step in your PADI Open Water Diver training is the certification. 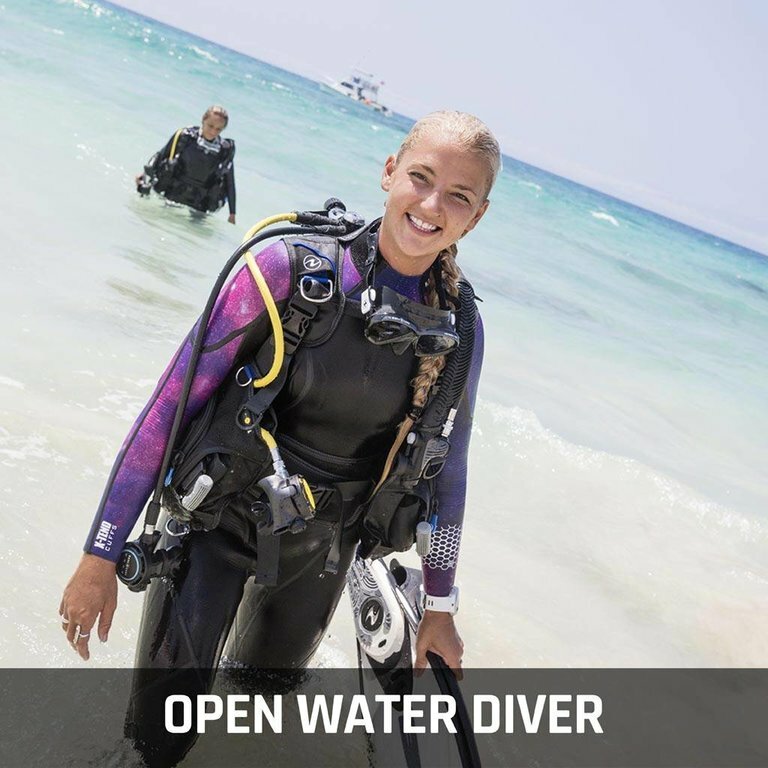 Comprised of four open water dives, you will apply the skills you learned in the pool to open water environments. There are two options for completing your certification: With Total Diving or elsewhere. There are many advantages to completing your certification dives with us. We use the Kahnawake Quarry for our open water dives to ensure a secure diving spot for all of our students. Total Diving has exclusive access to the Quarry, which is only minutes from our store, on the South Shore, toward Chateauguay. Designed to make sure you’re diving safely, the certification process takes place over two days. The other option is to do your certification on your next vacation in sunny locations like Bahamas, Cozumel and Martinique during the winter. Basically, you can do your certification at any PADI-certified dive store! Total Diving can refer you to the resort you’ll be staying at, so you won’t have to wait to be certified when the Quarry re-opens in the Spring. However, if you are doing your training before your vacation, and we have access to the Quarry, we recommend completing your PADI certification dives with us. It will give you more time to dive, dive, dive during your vacations. If you finish your certification in Montreal, you’ll have plenty of time to explore on your next vacation. Scuba diving is a sport completely out of your ordinary routine. Just because you work a 9-to-5 job doesn’t mean your days have to be long and dull. Learning to dive isn’t only fun and exciting, it’s also a life-altering experience. We can’t stress enough about how amazing it is to be able to breathe underwater! Our planet is 70% water… why not start exploring? See the rest of your planet! We understand as well as anybody that comfort and safety are at the top of your priorities. Trying a new extreme sport can seem daunting at first, but our specialized team of instructors, divemasters and dive store staff are ready to help with all of your questions and concerns. Total Diving is committed to the highest level of safety for all of our students. We offer a heated, indoor pool for your training, to assure that you understand all of the skills required to become a well-rounded diver. We also complete most of our certification dives at the Kahnawake Quarry, which we have exclusive access to. Total Diving works closely with a doctor who specializes in diving medicine to help verify that you’re in good shape to start your journey! Rest assured that our dedicated and professional team will guide you from the moment you start PADI eLearning, all the way to the last certification dive. Discovering a new world! Visit the rest of the planet. If you get excited seeing fish during your snorkeling trips while on vacation, you’ll be blown away by the beauty of coral reefs, different types of fish, and even sharks (but don’t worry, they’re friendly)! Scuba diving opens the door to an entire new world, where you’ll be able to discover things you’ll never have seen before. Travelling to different dive sites, like Cozumel, Roatan, the Bahamas and Australia all have different attractions that will sweep you off your feet. Even local dive sites like Ivy Lea, les Escoumins and Lock 21 are accessible from Montreal and allow you to not only practice, but to get to know the local environment. Let Total Diving open new doors for your adventures. Unfortunately, we won’t all be able to go to space. However, scuba diving offers a new feeling of freedom and weightlessness that is supposed to be as close as the average person can get to being in outer space. You’ll never feel as free on land as you will underwater. Let currents, deep dives and other magnificent features of scuba diving take you far away from your comfort zone, all while staying absolutely safe and secure. Seize the day! Don’t let yourself sit idle while every single day passes by, monotonously. Learning to scuba dive will teach you things about the world, about yourself, and about how to live. The world we live in is huge, and we’ve barely started to discover all the possibilities out there. You’ll never truly know yourself if you don’t push yourself out of your comfort zone. And finally, you won’t truly be able to live without learning to explore and adventure! Let Total Diving help you reach your full potential and your goals. Be proud! And have cool stuff to share on Facebook! Sure, we can talk about how much fun, how intense, and how amazing scuba diving is. But what makes it all truly worth it is the community you become a part of. In Montreal alone, there are thousands of divers who make up a global community where people go diving, share their experiences, tips and tricks, and who can become lifelong friends. People often make the mistake in thinking that diving is an individual sport. Diving is always done in groups, or with buddies, who are just as responsible for your wellbeing as you are for theirs. Become part of a group of fun and diverse individuals who are always ready for the next adventure!